The NATO bombing of Yugoslavia was the North Atlantic Treaty Organisation's (NATO) military operation against the Federal Republic of Yugoslavia (FRY) during the Kosovo War. The air strikes lasted from March 24, 1999 to June 10, 1999. The official NATO operation code name was Operation Allied Force; the United States called it "Operation Noble Anvil", while in Yugoslavia, the operation was incorrectly called "Merciful Angel" (Serbian: Милосрдни анђео / Milosrdni anđeo), as a result of a misunderstanding or mistranslation. The bombings continued until an agreement was reached that led to the withdrawal of Yugoslav armed forces from Kosovo, and the establishment of United Nations Interim Administration Mission in Kosovo (UNMIK), a UN peacekeeping mission in Kosovo. The bloodshed, ethnic cleansing of thousands of Albanians driving them into neighbouring countries, and the potential of it to destabilize the region provoked intervention by international organizations and agencies, such as the United Nations, NATO, and INGOs. NATO countries attempted to gain authorisation from the United Nations Security Council for military action, but were opposed by China and Russia that indicated they would veto such a proposal. NATO launched a campaign without UN authorisation, which it described as a humanitarian intervention. The FRY described the NATO campaign as an illegal war of aggression against a sovereign country that was in violation of international law because it did not have UN Security Council support. The bombing killed between 489 and 528 civilians, and destroyed bridges, industrial plants, public buildings, private businesses, as well as barracks and military installations. In the days after the Yugoslav Army withdrew, over 164,000 Serbs (around 75%)[not in citation given] and 24,000 Roma (around 85%)[not in citation given] left Kosovo and many of the remaining civilians were victims of abuse. After Kosovo and other Yugoslav Wars, Serbia became home to the highest number of refugees and IDPs (including Kosovo Serbs) in Europe. The NATO bombing marked the second major combat operation in its history, following the 1995 NATO bombing campaign in Bosnia and Herzegovina. It was the first time that NATO had used military force without the approval of the UN Security Council. After September 1990 when the 1974 Yugoslav Constitution had been unilaterally repealed by the Socialist Republic of Serbia, Kosovo's autonomy suffered and so the region was faced with state organized oppression: from the early 1990s, Albanian language radio and television were restricted and newspapers shut down. Kosovar Albanians were fired in large numbers from public enterprises and institutions, including banks, hospitals, the post office and schools. In June 1991 the University of Priština assembly and several faculty councils were dissolved and replaced by Serbs. Kosovar Albanian teachers were prevented from entering school premises for the new school year beginning in September 1991, forcing students to study at home. Later, Kosovar Albanians started an insurgency against Belgrade when the Kosovo Liberation Army was founded in 1996. Armed clashes between the two sides broke out in early 1998. A NATO-facilitated ceasefire was signed on 15 October, but both sides broke it two months later and fighting resumed. When the killing of 45 Kosovar Albanians in the Račak massacre was reported in January 1999, NATO decided that the conflict could only be settled by introducing a military peacekeeping force to forcibly restrain the two sides. After the Rambouillet Accords broke down on 23 March with Yugoslav rejection of an external peacekeeping force, NATO prepared to install the peacekeepers by force. Establishment of a political framework agreement for Kosovo based on Rambouillet Accords, in conformity with international law and the Charter of the United Nations. Due to restrictive media laws, media in Yugoslavia carried little coverage of what its forces were doing in Kosovo, or of other countries' attitudes to the humanitarian crisis; so, few members of the public expected bombing, instead thinking that a diplomatic deal would be made. According to John Keegan, the capitulation of Yugoslavia in the Kosovo War marked a turning point in the history of warfare. It "proved that a war can be won by air power alone". By comparison, diplomacy had failed before the war, and the deployment of a large NATO ground force was still weeks away when Slobodan Milošević agreed to a peace deal. Bombardment needs to be capable of causing destruction while minimising casualties. This causes pressure within the population to end hostilities rather than to prolong them. The exercise of precision air power in the Kosovo War is said[by whom?] to have provided this. The government must be susceptible to pressure from within the population. As was demonstrated by the overthrow of Milošević a year later, the Yugoslav government was only weakly authoritarian and depended upon support from within the country. There must be a disparity of military capabilities such that the opponent is unable to inhibit the exercise of air superiority over its territory. Serbia, a relatively small impoverished Balkan state, faced a much more powerful NATO coalition including the United Kingdom and the United States. Carl von Clausewitz once called the "essential mass of the enemy" his "centre of gravity". Should the center of gravity be destroyed, a major factor in Yugoslav will to resist would be broken or removed. In Milošević's case, the centre of gravity was his hold on power. He manipulated hyperinflation, sanctions and restrictions in supply and demand to allow powerful business interests within Serbia to profit and they responded by maintaining him in power. The damage to the economy, which squeezed it to a point where there was little profit to be made, threatened to undermine their support for Milošević if the air campaign continued, whilst causing costly infrastructure damage. According to British Lieutenant-General Mike Jackson, Russia's decision on June 3, 1999 to back the West and to urge Milošević to surrender was the single event that had "the greatest significance in ending the war". The Yugoslav capitulation came the same day. Russia relied on Western economic aid at the time, which made it vulnerable to pressure from NATO to withdraw support for Milošević. Milošević's indictment by the UN as a war criminal (on May 24, 1999), even if it did not influence him personally, made the likelihood of Russia resuming diplomatic support less likely. The Rambouillet Agreement of March 18, 1999, had Yugoslavia agreed to it, would have given NATO forces the right of transit, bivouac, manoeuvre, billet, and utilisation across Serbia. By the time Milošević capitulated, NATO forces were to have access only to Kosovo proper. The international civil presence in the province was to be under UN control which allowed for a Russian veto should Serb interests be threatened. Concurrent ground operations – The KLA undertook operations in Kosovo itself and had some successes against Serb forces. The Yugoslav army abandoned a border post opposite Morinë near the Yugoslav army outpost at Kosare in the north west of the province. The Yugoslav army outpost at Kosare remained in Yugoslav hands throughout the war: this allowed for a supply line to be set up into the province and the subsequent taking of territory in the Junik area. The KLA also penetrated a few miles into the south-western Mount Pastrik area. But most of the province remained under Serb control. Potential ground attack – General Wesley Clark, Supreme Allied Commander Europe, was "convinced" that planning and preparations for ground intervention "in particular, pushed Milošević to concede". The Yugoslav capitulation occurred on the same day that U.S. President Bill Clinton held a widely publicised meeting with his four service chiefs to discuss options for a ground-force deployment in case the air war failed. However, France and Germany vigorously opposed a ground offensive, and had done so for some weeks, since April 1999. French estimates suggested that an invasion would need an army of 500,000 to achieve success. This left NATO, particularly the United States, with a clear view that a land operation had no support. With this in mind, the Americans reaffirmed their faith in the air campaign. The reluctance of NATO to use ground forces casts serious doubt on the idea that Milošević capitulated out of fear of a land invasion. On March 20, 1999 OSCE Kosovo Verification Mission monitors withdrew from Kosovo citing a "steady deterioration in the security situation", and on March 23, 1999 Richard Holbrooke returned to Brussels and announced that peace talks had failed. Hours before the announcement, Yugoslavia announced on national television it had declared a state of emergency citing an "imminent threat of war ... against Yugoslavia by Nato" and began a huge mobilisation of troops and resources. On March 23, 1999 at 22:17 UTC the Secretary General of NATO, Javier Solana, announced he had directed the Supreme Allied Commander Europe (SACEUR), General Wesley Clark, to "initiate air operations in the Federal Republic of Yugoslavia." On March 24 at 19:00 UTC NATO started the bombing campaign against Yugoslavia. The campaign involved 1,000 aircraft operating from air bases in Italy and Germany, and the aircraft carrier USS Theodore Roosevelt stationed in the Adriatic Sea. F/A-18 Hornets of the Spanish Air Force were the first NATO planes to bomb Belgrade and perform SEAD operations. BGM-109 Tomahawk cruise missiles were fired from ships and submarines. The U.S. was the dominant member of the coalition against Yugoslavia, although other NATO members were involved. During the ten weeks of the conflict, NATO aircraft flew over 38,000 combat missions. For the German Air Force, this mission was its first conflict participation since World War II. In addition to air power, one battalion of Apache helicopters from the U.S. Army's 11th Aviation Regiment was deployed to help combat missions. The regiment was augmented by pilots from Fort Bragg's 82nd Airborne Attack Helicopter Battalion. The battalion secured AH-64 Apache attack helicopter refueling sites, and a small team forward deployed to the Albania – Kosovo border to identify targets for NATO air strikes. The campaign was initially designed to destroy Yugoslav air defenses and high-value military targets. [citation needed] NATO military operations increasingly attacked Yugoslav units on the ground, as well as continuing the strategic bombardment. Montenegro was bombed several times, and NATO refused to prop up the precarious position of its anti-Milošević leader, Milo Đukanović. "Dual-use" targets, used by civilians and military, were attacked, including bridges across the Danube, factories, power stations, telecommunications facilities, the headquarters of Yugoslav Leftists, a political party led by Milošević's wife, and the Avala TV Tower. Some protested that these actions were violations of international law and the Geneva Conventions. NATO argued these facilities were potentially useful to the Yugoslav military and thus their bombing was justified. On April 14, NATO planes bombed ethnic Albanians near Koriša who had been used by Yugoslav forces as human shields. Yugoslav troops took TV crews to the scene shortly after the bombing. The Yugoslav government insisted that NATO had targeted civilians. On May 7, NATO bombed the Chinese embassy in Belgrade, killing three Chinese journalists. NATO had aimed at a Yugoslav military target, but navigational errors led to the wrong building being targeted. The United States and NATO apologised for the bombing, saying it occurred because of an outdated map provided by the Central Intelligence Agency. The bombing strained relations between the People's Republic of China and NATO, provoking angry demonstrations outside Western embassies in Beijing. Solana directed Clark to "initiate air operations in the Federal Republic of Yugoslavia". Clark then delegated responsibility for the conduct of Operation Allied Force to the Commander-in-Chief of Allied Forces Southern Europe, who in turn delegated control to the Commander of Allied Air Forces Southern Europe, Lieutenant-General Michael C. Short, USAF. Operationally, the day-to-day responsibility for executing missions was delegated to the Commander of the 5th Allied Tactical Air Force. The Hague Tribunal ruled that over 700,000 Kosovo Albanians were forcibly displaced by Yugoslav forces into neighbouring Albania and Macedonia, with many thousands displaced within Kosovo. By April, the United Nations reported 850,000 refugees had left Kosovo. Another 230,000 were listed as internally displaced persons (IDPs): driven from their homes, but still inside Kosovo. German Foreign Minister Joschka Fischer claimed the refugee crisis was produced by a Yugoslav plan codenamed "Operation Horseshoe". Serbian Television claimed that huge columns of refugees were fleeing Kosovo because of NATO's bombing, not Yugoslav military operations. The Yugoslav side and its Western supporters claimed the refugee outflows were caused by a mass panic in the Kosovo Albanian population, and that the exodus was generated principally by fear of NATO bombs. The United Nations and international human rights organisations were convinced the crisis resulted from a policy of ethnic cleansing. Many accounts from both Serbs and Albanians identified Yugoslav security forces and paramilitaries as the culprits, responsible for systematically emptying towns and villages of their Albanian inhabitants by forcing them to flee. Atrocities against civilians in Kosovo were the basis of United Nations war crimes charges against Milošević and other officials responsible for directing the Kosovo conflict. An important portion of the war involved combat between the Yugoslav Air Force and the opposing air forces. United States Air Force F-15s and F-16s flying mainly from Italian air force bases attacked the defending Yugoslav fighters; mainly MiG-29s, which were in poor condition, due to lack of spare parts and maintenance. Other NATO forces also contributed to the air war. During the night of March 24/25, 1999: Yugoslav air force scrambled five MiG-29s to counter the initial attacks. The two fighters that took off from Niš Airport were vectored to intercept targets over southern Serbia and Kosovo, were dealt with by NATO fighters: the MiG-29 flown by Maj. Dragan Ilić was damaged. He landed with one engine out and the aircraft was later expended as a decoy. The second MiG, flown by Maj. Iljo Arizanov, was shot down by an USAF F-15C piloted by Lt. Col. Cesar Rodriguez. The pair from Batajnica Air Base (Maj. Nebojša Nikolić and Maj. Ljubiša Kulačin), were engaged by USAF Capt. Mike Shower who shot down Nikolić while Kulačin evaded several missiles fired at him while fighting to bring his malfunctioning systems back to working order. Eventually realising that he could not do anything, and with Batajnica AB under attack, he diverted to Belgrade Nikola Tesla Airport, and landed safely, his aircraft temporarily concealed under the tail of a parked retired airliner. The fifth and last MiG-29 to get airborne that night was flown by Maj. Predrag Milutinović. Immediately after take-off his radar failed and electrical generator malfunctioned. Shortly after, he was warned by SPO-15 of being acquired by fire control radar, but he eluded the opponent by several evasive manoeuvres. Attempting to evade further encounters, he approached Niš Airport intending to land when he was hit by an 2K12 Kub in a friendly fire incident and forced to eject. In total, the 127.LAE launched five MiG-29s on that night, of which three were shot down, one badly damaged, and one returned in unserviceable condition. Not a single pilot was killed – even if it would take few days until one of them was recovered. Closer examination of available evidence indicates that Maj. Arizanov was shot down by USAF Col. Rodriguez, while Majors Nikolic and Kulacin were engaged by USAF Capt. Showers, who eventually shot down Nikolic. Maj. Milutinovic's aircraft was probably shot down by a KLU F-16AM flown by Maj. Peter Tankink. In the morning of March 25: Maj. Slobodan Tešanović stalled his MiG-29 while landing on Ponikve Airbase after a re-base flight. He ejected safely. During the war Yugoslav strike aircraft J-22 Oraos and G-4 Super Galebs performed some 20–30 combat missions against the KLA in Kosovo at treetop level causing some casualties. During one of those missions on March 25, 1999, Lt. Colonel Života Ðurić was killed when his J-22 Orao hit a hill in Kosovo. It was never firmly established whether an aircraft malfunction, pilot error or an enemy action (by KLA) was the cause (NATO never claimed they shot it down). In the afternoon of March 25, 1999: Two Yugoslav MiG-29s took off from Batajnica to chase a lone NATO aircraft flying in the direction of Bosnia. They crossed the border and were engaged by two US F-15s. Both MiGs were shot down by Captain Jeff Hwang. One MiG pilot, Major Slobodan Perić having evaded at least one missile before being hit ejected and was later smuggled back to Yugoslavia by the Republika Srpska police. The other pilot, Captain Zoran Radosavljević, did not eject and was killed. On April 5–7, 1999, one Yugoslav MiG-29 was scrambled to intercept NATO aircraft, but each time Yugoslav pilots refused battle due to malfunctions. On April 30, some American sources confirm that a second F-117A was damaged by a surface-to-air missile. Although the aircraft returned to base, it supposedly never flew again. On May 2, an American F-16 was shot down near Šabac, by a SA-3 again fired by the 3rd Battalion of the 250th Missile Brigade. The pilot Lt. Colonel David Goldfein, commander of the 555th Fighter Squadron at the time was rescued. [citation needed] On the same day an A-10 Thunderbolt II was heavily damaged by Strela 2 shoulder-mounted SAM over Kosovo and had to make an emergency landing in Skopje, Macedonia. [not in citation given] Also a US-operated Harrier jump-jet crashed while returning to the amphibious assault carrier USS Kearsarge from a training mission. Its pilot was rescued. On May 4, a Yugoslav MiG-29, piloted by Lt. Col. Milenko Pavlović, commander of the 204th Fighter Aviation Wing, was shot down at a low altitude over his home town Valjevo by two USAF F-16s. The falling aircraft was possibly hit as well by Strela 2 fired by Yugoslav troops. Pavlović was killed. On May 11 an A-10 was lightly damaged over Kosovo. During the war NATO lost two AH-64 Apache strike helicopters (one on April 26 and the other on May 4 in Albania near the border with Yugoslavia, in training accidents resulting in death of two crew members). NATO reported that it lost 21 UAVs to technical failures or enemy action during the conflict, including at least seven German UAVs and five French UAVs. While the commander of the Yugoslav Third Army claimed that 21 NATO UAVs had been shot down by Yugoslav forces, another Yugoslav general claimed that Yugoslav air defenses and ground forces had shot down 30 UAVs. By the start of April, the conflict seemed closer to resolution. NATO countries began to deliberate about invading Kosovo with ground units. U.S. President Bill Clinton was reluctant to commit US forces for a ground offensive. At the same time, Finnish and Russian negotiators continued to try to persuade Milošević to back down. Faced with little alternative, Milošević accepted the conditions offered by a Finnish-Russian mediation team and agreed to a military presence within Kosovo headed by the UN, but incorporating NATO troops. On June 12, after Milošević accepted the conditions, KFOR began entering Kosovo. KFOR, a NATO force, had been preparing to conduct combat operations, but in the end, its mission was only peacekeeping. It was based upon the Allied Rapid Reaction Corps headquarters commanded by then Lieutenant General Mike Jackson of the British Army. It consisted of British forces (a brigade built from 4th Armored and 5th Airborne Brigades), a French Army Brigade, a German Army brigade, which entered from the west while all the other forces advanced from the south, and Italian Army and US Army brigades. The U.S. contribution, known as the Initial Entry Force, was led by the U.S. 1st Armored Division. Subordinate units included TF 1–35 Armor from Baumholder, Germany, the 2nd Battalion, 505th Parachute Infantry Regiment from Fort Bragg, North Carolina, the 26th Marine Expeditionary Unit from Camp Lejeune, North Carolina, the 1st Battalion, 26th Infantry Regiment from Schweinfurt, Germany, and Echo Troop, 4th Cavalry Regiment, also from Schweinfurt, Germany. Also attached to the U.S. force was the Greek Army's 501st Mechanised Infantry Battalion. The initial U.S. forces established their area of operation around the towns of Uroševac, the future Camp Bondsteel, and Gnjilane, at Camp Monteith, and spent four months – the start of a stay which continues to date – establishing order in the southeast sector of Kosovo. The first NATO troops to enter Pristina on June 12, 1999 were Norwegian special forces from FSK Forsvarets Spesialkommando and soldiers from the British Special Air Service 22 S.A.S, although to NATO's diplomatic embarrassment Russian troops arrived first at the airport. The Norwegian soldiers from FSK Forsvarets Spesialkommando were the first to come in contact with the Russian troops at the airport. FSK's mission was to level the negotiating field between the belligerent parties, and to fine-tune the detailed, local deals needed to implement the peace deal between the Serbians and the Kosovo Albanians. During the initial incursion, the U.S. soldiers were greeted by Albanians cheering and throwing flowers as U.S. soldiers and KFOR rolled through their villages. [citation needed] Although no resistance was met, three U.S. soldiers from the Initial Entry Force lost their lives in accidents. In 2010 James Blunt in an interview described how his unit was given the assignment of securing the Pristina in advance of the 30,000-strong peacekeeping force and the Russian army had moved in and taken control of the airport before his unit's arrival. As the first officer on the scene, Blunt shared a part in the difficult task of addressing the potentially violent international incident. His own account tells of how he refused to follow orders from NATO command to attack the Russians. Outpost Gunner was established on a high point in the Preševo Valley by Echo Battery 1/161 Field Artillery in an attempt to monitor and assist with peacekeeping efforts in the Russian Sector. Operating under the support of 2/3 Field Artillery, 1st Armored Division, the Battery was able to successfully deploy and continuously operate a Firefinder Radar which allowed the NATO forces to keep a closer watch on activities in the Sector and the Preševo Valley. Eventually a deal was struck whereby Russian forces operated as a unit of KFOR but not under the NATO command structure. While not directly related to the hostilities, on March 12, 1999 the Czech Republic, Hungary, and Poland joined NATO by depositing instruments of accession in accordance with Article 10 of the North Atlantic Treaty at a ceremony in Independence, Missouri. These nations did not participate directly in hostilities. A large element of the operation was the air forces of NATO, relying heavily on the US Air Force and Navy. The French Navy and Air Force operated the Super Etendard and the Mirage 2000. The Italian Air Force operated with 34 Tornado, 12 F-104, 12 AMX, 2 B-707, the Italian Navy operated with Harrier II. The British Royal Air Force operated the Harrier GR7 and Tornado ground attack jets as well as an array of support aircraft. Belgian, Danish, Dutch, Norwegian and Turkish Air Forces operated F-16s. The Spanish Air Force deployed EF-18s and KC-130s. The Canadian Air Force deployed a total of 18 CF-18s, enabling them to be responsible for 10% of all bombs dropped in the operation. The fighters were armed with both guided and unguided "dumb" munitions, including the Paveway series of laser-guided bombs. [citation needed] The bombing campaign marked the first time the German Air Force actively participated in combat operations since the end of World War II. However, NATO forces relied mostly upon the Americans and the proven effectiveness of its air power by using the F-16, F-15, F-117, F-14, F/A-18, EA-6B, B-52, KC-135, KC-10, AWACS, and JSTARS from bases throughout Europe and from aircraft carriers in the region. The American B-2 Spirit stealth bomber also saw its first successful combat role in Operation Allied Force, all while striking from its home base in the continental United States. Even with this air power, noted a RAND Corporation study, "NATO never fully succeeded in neutralising the enemy's radar-guided SAM threat". Operation Allied Force incorporated the first large-scale use of satellites as a direct method of weapon guidance. The collective bombing was the first combat use of the Joint Direct Attack Munition JDAM kit, which uses an inertial-guidance and GPS-guided tail fin to increase the accuracy of conventional gravity munitions up to 95%. The JDAM kits were outfitted on the B-2s. The AGM-154 Joint Standoff Weapon (JSOW) had been previously used in Operation Southern Watch earlier in 1999. NATO naval forces operated in the Adriatic Sea. The Royal Navy sent a substantial task force that included the aircraft carrier HMS Invincible, which operated Sea Harrier FA2 fighter jets. The RN also deployed destroyers and frigates, and the Royal Fleet Auxiliary (RFA) provided support vessels, including the aviation training/primary casualty receiving ship RFA Argus. It was the first time the RN used cruise missiles in combat, operated from the nuclear fleet submarine HMS Splendid. The Italian Navy provided a naval task force that included the aircraft carrier Giuseppe Garibaldi, a frigate (<i>Maestrale</i>) and a submarine (Sauro class). The United States Navy provided a naval task force that included the aircraft carrier USS Theodore Roosevelt, USS Vella Gulf, and the amphibious assault ship USS Kearsarge. The French Navy provided the aircraft carrier Foch and escorts. The German Navy deployed the frigate Rheinland-Pfalz and Oker, an Oste-class fleet service ship, in the naval operations. The Netherlands send the submarine HNLMS Dolfijn to upheld trade embargoes off the coast of Yugoslavia. NATO ground forces included a U.S. battalion from the 505th Parachute Infantry Regiment, 82nd Airborne Division. The unit was deployed in March 1999 to Albania in support of the bombing campaign where the battalion secured the Tirana airfield, Apache helicopter refueling sites, established a forward-operating base to prepare for Multiple Launch Rocket System (MLRS) strikes and offensive ground operations, and deployed a small team with an AN/TPQ-36 Firefinder radar system to the Albania/Kosovo border where it acquired targets for NATO air strikes. Immediately after the bombing campaign, the battalion was refitted back at Tirana airfield and issued orders to move into Kosovo as the initial entry force in support of Operation Joint Guardian. Task Force Hawk was also deployed. Task Force Hunter, a US surveillance unit based upon the IAI RQ-5 Hunter drone "A" Company from a Forces Command (FORSCOM) Corps Military Intelligence Brigade (MI Bde) was deployed to Camp Able Sentry, Macedonia, in March, to provide real-time intelligence on Yugoslav forces inside Kosovo. They flew a total of 246 sorties, with five drones lost to enemy fire. A German Army drone battery based at Tetovo was tasked with a similar mission. German forces used CL-289 UAVs from December 1998 to July 1999 to fly 237 sorties over Yugoslav positions, with six drones lost to hostile fire. Human Rights Watch concluded "that as few as 489 and as many as 528 Yugoslav civilians were killed in the ninety separate incidents in Operation Allied Force". Refugees were among the victims. Between 278 and 317 of the deaths, nearly 60 percent of the total number, were in Kosovo. In Serbia, 201 civilians were killed (five in Vojvodina) and eight died in Montenegro. Almost two-thirds (303 to 352) of the total registered civilian deaths occurred in twelve incidents where ten or more civilian deaths were confirmed. According to one Serbian claim, NATO tactics sometimes included second post strikes in populated areas, with the aim of destroying rescue and medical teams. Military casualties on the NATO side were limited. According to official reports, the alliance suffered no fatalities from combat operations. However, on May 5, an American AH-64 Apache crashed and exploded during a night-time mission in Albania. The Yugoslavs claimed they shot it down, but NATO claimed it crashed due to a technical malfunction. It crashed 40 miles from Tirana, killing the two crewmen, Army Chief Warrant Officers David Gibbs and Kevin Reichert. It was one of two Apache helicopters lost in the war. A further three American soldiers were taken as prisoners of war by Yugoslav special forces while riding on a Humvee on a surveillance mission along the Macedonian border with Kosovo. A study of the campaign reports that Yugoslav air defenses may have fired up to 700 missiles at NATO aircraft, and that the B-1 bomber crews counted at least 20 surface-to-air missiles fired at them during their first 50 missions. Despite this, only two NATO manned aircraft (one F-16C and one F-117A Nighthawk) were shot down. A further F-117A Nighthawk was damaged by hostile fire as were two A-10 Thunderbolt IIs. One AV-8B Harrier crashed in the Adriatic Sea due to technical failure. NATO also lost 25 UAVs, either due to enemy action or mechanical failure. Yugoslavia's 3rd Army commander, Lt. Gen. Nebojsa Pavkovic, claimed that Yugoslav forces shot down 51 NATO aircraft, though no other source verified these numbers. In 2013, Serbia's then-Defence Minister Aleksandar Vučić announced that Yugoslavia's military and police losses during the air campaign amounted to 956 killed and 52 missing. Vučić stated that 631 soldiers were killed and a further 28 went missing, and that 325 police officers were also among the dead with a further 24 listed as missing. The government of Serbia also lists 5,173 combatants as having been wounded. In early June 1999, while the bombing was still in progress, NATO officials claimed that 5,000 Yugoslav troops had been killed in the bombing and a further 10,000 wounded. NATO later revised this estimation to 1,200 soldiers and policemen killed. Post-strike bomb damage assessment photo of Zastava car plant. Throughout the war; 181 NATO strikes were reported against tanks, 317 against armored personnel vehicles, 800 against other military vehicles, and 857 against artillery and mortars, after a total of 38,000 sorties, or 200 sorties per day at the beginning of the conflict and over 1,000 at the end of the conflict. When it came to alleged hits, 93 tanks, 153 APCs, 339 other vehicles, and 389 artillery systems were believed to have been disabled or destroyed with certainty. The Department of Defense and Joint Chief of Staff had earlier provided a figure of 120 tanks, 220 APCs, and 450 artillery systems, and a Newsweek piece published around a year later stated that only 14 tanks, 12 self-propelled guns, 18 APCs, and 20 artillery systems had actually been obliterated, not that far from the Yugoslavs' own estimates of 13 tanks, 6 APCs, and 6 artillery pieces. However, this reporting was heavily criticised, as it was based on the number of vehicles found during the assessment of the Munitions Effectiveness Assessment Team, which wasn't interested in the effectiveness of anything but the ordnance, and surveyed sites that hadn't been visited in nearly three-months, at a time when the most recent of strikes were four-weeks old. The Yugoslav Air Force also sustained serious damage, with 121 aircraft destroyed. Relatives of Italian soldiers believe 50 of them have died since the war due to their exposure to depleted uranium weapons. UNEP tests found no evidence of harm by depleted uranium weapons, even among cleanup workers, but those tests and UNEP's report were questioned in an article in Le Monde diplomatique. In April 1999, during the NATO bombing, officials in Yugoslavia said the damage from the bombing campaign has cost around $100 billion up to that time. In 2000, a year after the bombing ended, Group 17 published a survey dealing with damage and economic restoration. The report concluded that direct damage from the bombing totalled $3.8 billion, not including Kosovo, of which only 5% had been repaired at that time. When NATO agreed Kosovo would be politically supervised by the United Nations, and that there would be no independence referendum for three years, the Yugoslav government agreed to withdraw its forces from Kosovo, under strong diplomatic pressure from Russia, and the bombing was suspended on June 10. The war ended June 11, and Russian paratroopers seized Slatina airport to become the first peacekeeping force in the war zone. As British troops were still massed on the Macedonian border, planning to enter Kosovo at 5:00 am, the Serbs were hailing the Russian arrival as proof the war was a UN operation, not a NATO operation. After hostilities ended, on June 12 the U.S. Army's 82nd Airborne, 2–505th Parachute Infantry Regiment entered Kosovo as part of Operation Joint Guardian. Yugoslav President Milošević survived the conflict, however, he was indicted for war crimes by the International Criminal Tribunal for the Former Yugoslavia along with a number of other senior Yugoslav political and military figures. His indictment led to Yugoslavia as a whole being treated as a pariah by much of the international community because Milošević was subject to arrest if he left Yugoslavia. The country's economy was badly affected by the conflict, and in addition to electoral fraud, this was a factor in the overthrow of Milošević. Thousands were killed during the conflict, and hundreds of thousands more fled from the province to other parts of the country and to the surrounding countries. Most of the Albanian refugees returned home within a few weeks or months. However, much of the non-Albanian population again fled to other parts of Serbia or to protected enclaves within Kosovo following the operation. Albanian guerrilla activity spread into other parts of Serbia and to the neighbouring Republic of Macedonia, but subsided in 2001. The non-Albanian population has since diminished further following fresh outbreaks of inter-communal conflict and harassment. In December 2002, Elizabeth II approved the awarding of the Battle Honour "Kosovo" to squadrons of the RAF that participated in the conflict. These were: Nos 1, 7, 8, 9, 14, 23, 31, 51, 101, and 216 squadrons. This was also extended to the Canadian squadrons deployed to the operation, 425 and 441. Ten years after the operation, the Republic of Kosovo declared independence with a new Republic of Kosovo government. Those who were involved in the NATO airstrikes have stood by the decision to take such action. U.S. President Bill Clinton's Secretary of Defense, William Cohen, said, "The appalling accounts of mass killing in Kosovo and the pictures of refugees fleeing Serb oppression for their lives makes it clear that this is a fight for justice over genocide." On CBS' Face the Nation Cohen claimed, "We've now seen about 100,000 military-aged men missing. ... They may have been murdered." Clinton, citing the same figure, spoke of "at least 100,000 (Kosovar Albanians) missing". Later, Clinton said about Yugoslav elections, "they're going to have to come to grips with what Mr. Milošević ordered in Kosovo. ... They're going to have to decide whether they support his leadership or not; whether they think it's OK that all those tens of thousands of people were killed. ..." In the same press conference, Clinton also said, "NATO stopped deliberate, systematic efforts at ethnic cleansing and genocide." Clinton compared the events of Kosovo to the Holocaust. CNN reported, "Accusing Serbia of 'ethnic cleansing' in Kosovo similar to the genocide of Jews in World War II, an impassioned Clinton sought Tuesday to rally public support for his decision to send U.S. forces into combat against Yugoslavia, a prospect that seemed increasingly likely with the breakdown of a diplomatic peace effort." President Clinton's Department of State also claimed Yugoslav troops had committed genocide. The New York Times reported, "the Administration said evidence of 'genocide' by Serbian forces was growing to include 'abhorrent and criminal action' on a vast scale. The language was the State Department's strongest up to that time in denouncing Yugoslav President Slobodan Milošević." The Department of State also gave the highest estimate of dead Albanians. In May 1996, Defense Secretary William Cohen suggested that there might be up to 100,000 Albanian fatalities." Five months after the conclusion of NATO bombing, when around one third of reported gravesites had been visited thus far, 2,108 bodies had been found, with an estimated total of between 5,000 and 12,000 at that time; Yugoslav forces had systematically concealed grave sites and moved bodies. The United States House of Representatives passed a non-binding resolution on March 11, 1999 by a vote of 219–191 conditionally approving of President Clinton's plan to commit 4,000 troops to the NATO peacekeeping mission. In late April, the House Appropriations Committee approved $13 billion in emergency spending to cover the cost of the air war, but a second non-binding resolution approving of the mission failed in the full House by a vote of 213–213. The Senate had passed the second resolution in late March by a vote of 58–41. There has also been criticism of the campaign. The Clinton administration was accused of inflating the number of Kosovar Albanians killed by Serbs. In an interview with Radio-Television Serbia journalist Danilo Mandic on April 25, 2006, Noam Chomsky claimed that Strobe Talbott, the Deputy Secretary of State under President Clinton and the leading U.S. negotiator during the war, had written in his foreword to John Norris' 2005 book Collision Course: NATO, Russia, and Kosovo that "the real purpose of the war had nothing to do with concern for Kosovar Albanians", but rather "It was because Serbia was not carrying out the required social and economic reforms, meaning it was the last corner of Europe which had not subordinated itself to the US-run neoliberal programs, so therefore it had to be eliminated". On May 31, 2006, Brad DeLong rebutted Chomsky's allegation and quoted from elsewhere in the passage which Chomsky had cited, "the Kosovo crisis was fueled by frustration with Milosevic and the legitimate fear that instability and conflict might spread further in the region" and also that "Only a decade of death, destruction, and Milosevic brinkmanship pushed NATO to act when the Rambouillet talks collapsed. Most of the leaders of NATO's major powers were proponents of 'third way' politics and headed socially progressive, economically centrist governments. None of these men were particularly hawkish, and Milosevic did not allow them the political breathing room to look past his abuses." Israeli Minister of Foreign Affairs Ariel Sharon criticised the NATO bombing of Yugoslavia as an act of "brutal interventionism" and said Israel was against "aggressive actions" and "hurting innocent people" and hoped "the sides will return to the negotiating table as soon as possible". However, later into the campaign, Prime Minister Benjamin Netanyahu expressed support for NATO's mission in the war and Israel provided medical assistance to 112 Kosovar Albanian refugees and housed them in Israel. On April 29, 1999, Yugoslavia filed a complaint at the International Court of Justice (ICJ) at The Hague against ten NATO member countries (Belgium, Germany, France, United Kingdom, Italy, Canada, the Netherlands, Portugal, Spain, and the United States) and alleged that the military operation had violated Article 9 of the 1948 Genocide Convention and that Yugoslavia had jurisdiction to sue through Article 38, para. 5 of Rules of Court. On June 2, the ICJ ruled in an 8–4 vote that Yugoslavia had no such jurisdiction. Four of the ten nations (the United States, France, Italy and Germany) had withdrawn entirely from the court's "optional clause." Because Yugoslavia filed its complaint only three days after accepting the terms of the court's optional clause, the ICJ ruled that there was no jurisdiction to sue either Britain or Spain, as the two nations had only agreed to submit to ICJ lawsuits if a suing party had filed their complaint a year or more after accepting the terms of the optional clause. Despite objections that Yugoslavia had legal jurisdiction to sue Belgium, the Netherlands, Canada and Portugal, the ICJ majority vote also determined that the NATO bombing was an instance of "humanitarian intervention" and thus did not violate Article 9 of the Genocide Convention. Amnesty International released a report which stated that NATO forces had deliberately targeted a civilian object (NATO bombing of the Radio Television of Serbia headquarters), and had bombed targets at which civilians were certain to be killed. The report was rejected by NATO as "baseless and ill-founded". A week before the report was released, Carla Del Ponte, the chief prosecutor for the International Criminal Tribunal for the former Yugoslavia had told the United Nations Security Council that her investigation into NATO actions found no basis for charging NATO or its leaders with war crimes. A majority of U.S. House Republicans voted against two resolutions, both of which expressed approval for American involvement in the NATO mission. Moscow criticised the bombing as a breach of international law and a challenge to Russia's status. ^ Reidun J. Samuelsen (March 26, 1999). "Norske jagerfly på vingene i går". Aftenposten (in Norwegian). Archived from the original on January 19, 2012. Retrieved October 26, 2016. ^ "Turkish Air Force". Hvkk.tsk.tr. Archived from the original on May 13, 2009. Retrieved March 24, 2009. ^ "NATO & Kosovo: Index Page". www.nato.int. Archived from the original on September 12, 2016. Retrieved October 26, 2016. ^ "NATO hits Montenegro, says Milosevic faces dissent" Archived April 9, 2008, at the Wayback Machine, CNN, April 29, 1999. Stigler, Andrew L. "A clear victory for air power: NATO's empty threat to invade Kosovo." International Security 27.3 (2003): 124–157. Biddle, Stephen. "The new way of war? Debating the Kosovo model." (2002): 138–144. Dixon, Paul. "Victory by spin? Britain, the US and the propaganda war over Kosovo." Civil Wars 6.4 (2003): 83–106. Harvey, Frank P. "Getting NATO's success in Kosovo right: The theory and logic of counter-coercion." Conflict Management and Peace Science 23.2 (2006): 139–158. ^ "Serbia marks another anniversary of NATO attacks - English - on B92.net". Archived from the original on September 10, 2016. Retrieved April 29, 2017. ^ Zunes, Stephen (July 6, 2009). "The US War on Yugoslavia: Ten Years Later". Archived from the original on August 31, 2017. Retrieved April 16, 2018. ^ "Abuses against Serbs and Roma in the new Kosovo". Human Rights Watch. August 1999. ^ Hudson, Robert; Bowman, Glenn (2012). After Yugoslavia: Identities and Politics Within the Successor States. p. 30. ISBN 9780230201316. ^ "Kosovo Crisis Update". UNHCR. August 4, 1999. ^ Siobhán Wills (26 February 2009). Protecting Civilians: The Obligations of Peacekeepers. Oxford University Press. p. 219. ISBN 978-0-19-953387-9. Retrieved 24 February 2013. ^ Lambeth, Benjamin S. "Task Force Hawk". Airforce-magazine.com. Archived from the original on November 16, 2012. Retrieved September 27, 2012. ^ "Operation Allied Force – Operation Allied Force in Kosovo". Militaryhistory.about.com. Archived from the original on November 19, 2012. Retrieved September 27, 2012. ^ "Operation Determined Force / Allied Force Order of Battle Trends". Globalsecurity.org. Archived from the original on December 24, 2016. Retrieved October 26, 2016. ^ "Report to Congress: Kosovo operation allied force after-action report" (PDF). www.au.af.mil: 31–32. January 30, 2000. Archived (PDF) from the original on November 2, 2016. Retrieved October 26, 2016. ^ a b "NATO Operation Allied Force". Defense.gov. Archived from the original on November 18, 2016. Retrieved January 20, 2012. ^ Seven years since end of NATO bombing Archived September 26, 2015, at the Wayback Machine, 2006. "A group of economists from the G17 Plus party has estimated the total damages to be about 29.6 billion dollars". Retrieved September 18, 2015. ^ a b "Civilian Deaths in the NATO Air Campaign – The Crisis in Kosovo". HRW. Archived from the original on May 13, 2009. Retrieved January 20, 2012. ^ Bonnén, Preben (2003). Towards a common European security and defence policy: the ways and means of making it a reality. LIT Verlag Berlin-Hamburg-Münster. p. 188. ISBN 978-3-8258-6711-9. ^ Jordan, Robert S. (2001). International organizations: A comparative approach to the management of cooperation. Greenwood Publishing Group. p. 129. ISBN 9780275965495. ^ Yoshihara, Susan Fink (2006). "Kosovo". In Reveron, Derek S.; Murer, Jeffrey Stevenson. Flashpoints in the War on Terrorism. Routledge. pp. 67–68. ISBN 9781135449315. ^ "After Yugoslavia: Identities and Politics Within the Successor States". 2012. p. 30. ^ "Forced Expulsion of Kosovo Roma, Ashkali and Egyptians from OSCE Participated state to Kosovo". OSCE. October 6, 2006. ^ "Serbia home to highest number of refugees and IDPs in Europe". B92. 20 June 2010. ^ "Serbia: Europe's largest proctracted refugee situation". OSCE. 2008. ^ "15 years on: Looking back at NATO's 'humanitarian' bombing of Yugoslavia — RT News". www.rt.com. March 24, 2004. Archived from the original on December 3, 2016. Retrieved October 26, 2016. ^ NATO (April 12, 1999). "The situation in and around Kosovo". www.nato.int. Archived from the original on June 29, 2011. Retrieved August 2, 2011. ^ "Why Milosevic Decided to Settle the Conflict Over Kosovo When He Did" (PDF). Archived (PDF) from the original on September 4, 2018. Retrieved April 6, 2017. ^ "The Last War of the 20th century" (PDF). Archived (PDF) from the original on August 30, 2014. Retrieved March 24, 2018. ^ Judah (2009). The Serbs. Yale University Press. p. 327. ISBN 978-0-300-15826-7. ^ John Keegan, "Please, Mr Blair, never take such a risk again" Archived November 25, 2004, at the Wayback Machine. Telegraph, London, June 6, 1999. ^ Ritche in Cox and Gray 2002, p. 328. ^ Perlez, Jane (March 22, 1999). "Conflict in the Balkans: The Overview; Milosevic to Get One 'Last Chance' to Avoid Bombing". The New York Times. Retrieved February 15, 2009. ^ "Kosovo Verification Mission (Closed)". Organization for Security and Co-operation in Europe. Archived from the original on January 19, 2013. Retrieved October 22, 2012. ^ a b "Nato poised to strike". BBC News. March 23, 1999. Archived from the original on February 24, 2013. Retrieved August 19, 2011. ^ a b Gellman, Barton (March 24, 1999). "NATO Mobilizes for Attack / Yugoslavia declares state of emergency". Washington Post. San Francisco Chronicle. Archived from the original on January 4, 2013. Retrieved August 19, 2011. ^ "Press Statement by Dr. Javier Solana, Secretary General of NATO" (Press release). NATO. March 23, 1999. Archived from the original on November 27, 2011. Retrieved August 19, 2011. ^ > Independent International Commission on Kosovo (October 19, 2000). The Kosovo Report: Conflict, International Response, Lessons Learned. OUP Oxford. ISBN 978-0-19-924309-9. ^ "Press Statement by Dr. Javier Solana, NATO Secretary General following the Commencement of Air Operations" (Press release). NATO. March 24, 1999. Archived from the original on November 27, 2011. Retrieved August 19, 2011. ^ Englund (June 20, 1999). "Refugees call Korisa a setup". Baltimore Sun. Archived from the original on February 22, 2014. Retrieved July 4, 2012. ^ Krieger (2001). The Kosovo Conflict and International Law: An Analytical Documentation 1974–1999. Cambridge University Press. p. 352. ISBN 9780521800716. ^ "NATO says target was military post". Sunday Free Lance-Star. May 16, 1999. ^ "Once Again, NATO Admits Accidental Bombing of Civilians". Chicago Tribune. May 16, 1999. Archived from the original on February 22, 2014. Retrieved July 4, 2012. ^ "Yugoslavia says village death toll tops 100". CNN. Archived from the original on October 26, 2012. Retrieved August 19, 2011. ^ "Civilian Deaths in the NATO Air Campaign – The Crisis in Kosovo". Hrw.org. Archived from the original on May 13, 2009. Retrieved March 13, 2011. ^ a b "Final Report to the Prosecutor by the Committee Established to Review the NATO Bombing Campaign Against the Federal Republic of Yugoslavia". UNICTY. Archived from the original on September 14, 2012. Retrieved September 26, 2012. ^ Dumbaugh, Kerry (April 12, 2000). "Chinese Embassy Bombing in Belgrade:Compensation Issues". Congressional Research Service publication. Archived from the original on August 13, 2011. Retrieved April 8, 2010. ^ "Biographies: Lieutenant General Michael C. Short". Af.mil. Archived from the original on July 22, 2012. Retrieved January 20, 2012. ^ "JFC NAPLES – Allied Joint Force Command Naples | Operation Allied Force". Jfcnaples.nato.int. Archived from the original on November 12, 2010. Retrieved January 20, 2012. ^ Statistic from: "The Kosovo refugee crisis: an independent evaluation of UNHCR's emergency preparedness and response", UNHCR Evaluation and Policy Analysis Unit, February 2000. ^ "Air University – Serbian Information Operations During Operation Allied Force" (PDF). Archived (PDF) from the original on September 28, 2011. Retrieved January 20, 2012. ^ Zoller, Matt. "Laura Rozen: Serbia's culture shock". Archive.salon.com. Archived from the original on February 10, 2008. Retrieved January 20, 2012. ^ daenet d.o.o. (March 24, 1999). "SENSE Tribunal : ICTY". Sense-agency.com. Archived from the original on March 9, 2009. Retrieved March 24, 2009. 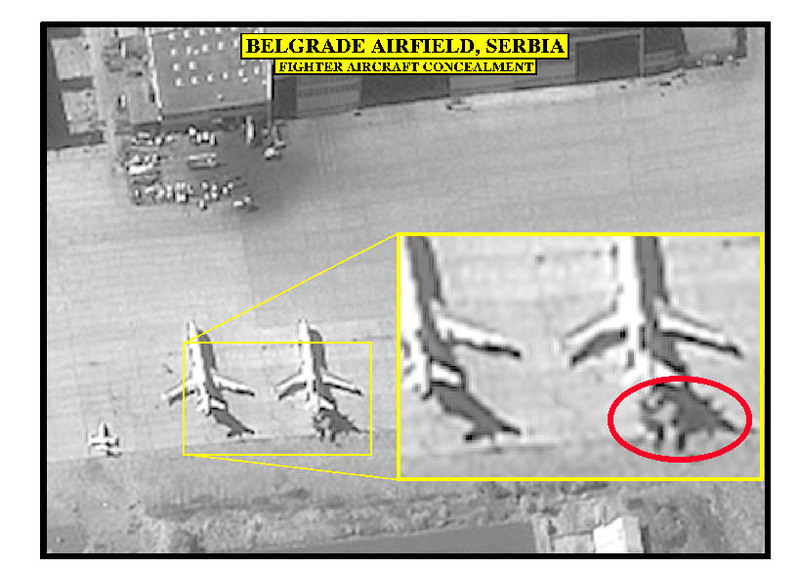 ^ "Belgrade Airport, Serbia – Aircraft Concealment". www.nato.int. Archived from the original on June 29, 2011. Retrieved April 24, 2011. ^ Lieven Dewitte (April 21, 1999). "How Dutch F-16AMs shot down a Mig-29". F-16.net. Archived from the original on November 4, 2016. Retrieved October 26, 2016. ^ Lieven Dewitte (March 24, 1999). "First combat success for F-16MLU". F-16.net. Archived from the original on October 26, 2016. Retrieved October 26, 2016. ^ a b "Chronological Listing of Federal Republic of Yugoslavia". Ejection-history.org.uk. Archived from the original on January 17, 2010. Retrieved March 13, 2011. ^ a b "Yugoslav & Serbian MiG-29s". Acig.org. Archived from the original on February 14, 2014. Retrieved October 26, 2016. ^ Schmitt, Eric (April 24, 1999). "Crisis in the Balkans: The air threat; Out of NATO's Reach: Yugoslavia's Treetop War". The New York Times. Archived from the original on June 18, 2013. Retrieved March 13, 2011. ^ "F-15 in Service". Faqs.org. Archived from the original on January 1, 2004. Retrieved October 26, 2016. ^ a b "Yugoslav & Serbian MiG-29s". Acig.org. Archived from the original on April 10, 2009. Retrieved March 24, 2009. ^ "Serb discusses 1999 downing of stealth". USA Today. October 26, 2005. Archived from the original on May 18, 2007. Retrieved May 8, 2007. ^ "Safe distance". dictionaryofwar.org. February 24, 2007. Archived from the original on March 8, 2015. Retrieved October 26, 2016. Found footage from the cockpit of the shot down F117. ^ a b "AJC.com Archive Search Results". nl.newsbank.com. Archived from the original on June 9, 2011. Retrieved January 30, 2012. ^ a b Riccioni, Colonel Everest E. "Description of our Failing Defence Acquisition System." Archived September 12, 2011, at the Wayback Machine Project on government oversight, March 8, 2005. Note: "This event, which occurred during the Kosovo conflict on March 27, was a major blow to the US Air Force. The aircraft was special: an F-117 Nighthawk stealth bomber that should have been all but invisible to the Serbian air defences. And this certainly wasn't a fluke—a few nights later, Serb missiles damaged a second F-117." ^ a b "John Sponauer – Hogs in a Hot Peace: The A-10 Since Desert Storm". Sponauer.com. Archived from the original on May 20, 2011. Retrieved March 13, 2011. ^ Rodgers, Walter (May 2, 1999). "Two jets crash in Kosovo campaign". cnnespanol.com. CNN. Archived from the original on June 20, 2013. Retrieved April 17, 2013. ^ John Pike. "AH-64 Apache". Globalsecurity.org. Archived from the original on April 16, 2011. Retrieved March 13, 2011. ^ Rip & Hasik 2002, p. 411. ^ Sergeant William Wright —B Company 9th Engineers (July 17, 1999); Specialist Sherwood Brim —B Company 9th Engineers(July 17, 1999); Private First Class Benjamin McGill – C Company 1st Battalion 26th Infantry (August 5, 1995). ^ "Singer James Blunt 'prevented World War III'". BBC. November 14, 2010. Archived from the original on July 30, 2018. Retrieved June 20, 2018. ^ "Confrontation over Pristina airport". BBC. March 9, 2000. Archived from the original on February 25, 2011. Retrieved February 8, 2008. ^ Douglas, Frank R. (2008). The United States, NATO, and a New Multilateral Relationship. Greenwood Publishing. p. 98. ISBN 978-0-313-34476-3. ^ Hyde-Price, Adrian (2001). "Germany and the Kosovo War: Still a Civilian Power?". In Douglas Webber, ed., New Europe, New Germany, Old Foreign Policy? : German Foreign Policy Since Unification, pp. 19–34. London and Portland, OR: Frank Cass. ISBN 978-0-714-65172-9. See p. 19. ^ "Onderzeeboten". www.sail.nl (in Dutch). Archived from the original on March 30, 2018. Retrieved December 17, 2017. ^ "Camp Able Sentry". www.globalsecurity.org. Retrieved 2019-03-24. ^ Ripley, Tim (2013). Conflict in the Balkans 1991–2000. Bloomsbury Publishing. p. 88. ISBN 1846037484. ^ "German Army upgrades CL-289 drones following Kosovo". Jane's International Defence Review. 33 (1–6). ^ "1,000th Flight of a German Reconnaissance Drone CL-289". www.defense-aerospace.com. Retrieved 2019-03-24. ^ "Spasilac kome je NATO spalio noge". www.novosti.rs. Archived from the original on March 24, 2017. Retrieved March 25, 2017. ^ Daniel Williams (April 2, 1999). "We're Trapped . . . We Can't Get Out'". The Washington Post. Archived from the original on March 3, 2016. Retrieved October 26, 2016. ^ "Two die in Apache crash" Archived April 6, 2008, at the Wayback Machine, BBC May 5, 1999. ^ "NATO & America losses in Serbia 1999". Irandefence.net. Archived from the original on March 5, 2009. Retrieved March 24, 2009. ^ a b Cordesman, Anthony H. (2001). The Lessons and Non-lessons of the Air and Missile Campaign in Kosovo. Greenwood Publishing Group. p. 349. ISBN 978-0-275-97230-1. ^ priest, Dana, "Army's Apache Helicopter Rendered Impotent in Kosovo" Archived June 20, 2017, at the Wayback Machine, Washington Post, December 29, 1999. Retrieved September 18, 2015. ^ John Pike. "Operation Allied Force". Globalsecurity.org. Archived from the original on March 4, 2012. Retrieved January 20, 2012. ^ "Holloman commander recalls being shot down in Serbia". F-16.net. Archived from the original on March 28, 2009. Retrieved March 24, 2009. ^ "Photos: General Dynamics F-16CG Night Falcon (401) Aircraft Pictures". Airliners.net. Archived from the original on March 29, 2009. Retrieved March 24, 2009. ^ "Photos: Lockheed F-117A Nighthawk Aircraft Pictures". Airliners.net. Archived from the original on March 29, 2009. Retrieved March 24, 2009. ^ "frontline: war in europe: facts & figures". Pbs.org. Archived from the original on November 22, 2012. Retrieved January 20, 2012. ^ "A-10 Thunderbolt II Draft Listing". www.ejection-history.org.ukaccess. August 19, 2011. Archived from the original on January 19, 2012. Retrieved February 20, 2012. ^ "81-0967 battle damaged in Kosovo during 1999". www.thewarthogpen.com. Archived from the original on September 12, 2012. Retrieved October 26, 2016. ^ "Nato loses two planes". BBC News. May 2, 1999. Archived from the original on January 14, 2014. Retrieved August 19, 2011. ^ a b c Aubin, Stephen P. (July 2000). "Newsweek and the 14 Tanks". Air Force-magazine.com. 83 (7). Archived from the original on November 16, 2012. Retrieved October 26, 2016. ^ "Stradalo 1.008 vojnika i policajaca" [1,008 soldiers and policemen were killed]. Radio Television of Serbia. February 11, 2013. Archived from the original on January 5, 2016. Retrieved November 7, 2015. ^ "Serbia marks anniversary of NATO bombing". B92.net. Archived from the original on November 4, 2013. Retrieved January 20, 2012. ^ "13th anniversary of NATO bombing". tanjug.rs. March 24, 2012. Archived from the original on May 12, 2012. Retrieved April 15, 2012. ^ "Kosovo: The conflict by numbers". BBC. June 11, 1999. Archived from the original on September 20, 2015. Retrieved November 7, 2015. ^ Bideleux, Robert; Jeffries, Ian (2006). The Balkans: A Post-Communist History. Routledge. p. 558. ISBN 978-0-203-96911-3. ^ Chambers II, John Whiteclay (1999). The Oxford Companion to American Military History. Oxford University Press. p. 375. ISBN 978-0-19-507198-6. ^ Coopersmith, Jonathan; Launius, Roger D. (2003). Taking Off: A Century of Manned Flight. American Institute of Aeronautics and Astronautics. p. 54. ISBN 978-1-56347-610-5. ^ Lambeth, 2001, p. 66-67. ^ Fraser, Christian (January 10, 2007). "Uranium 'killing Italian troops'". BBC News. Archived from the original on December 2, 2011. Retrieved August 19, 2011. ^ "Depleted Uranium in Serbia and Montenegro: UNEP Post-Conflict Environmental Assessment in the Federal Republic of Yugoslavia" (PDF). postconflict.unep.ch. Archived (PDF) from the original on July 7, 2011. Retrieved April 20, 2011. ^ "America's big dirty secret". mondediplo.com. March 3, 2002. Archived from the original on August 5, 2011. Retrieved August 19, 2011. ^ "Nato hits Milosevic HQ". BBC News. April 21, 1999. Archived from the original on October 18, 2015. Retrieved September 20, 2015. ^ Dinkic, Mladjan (July 9, 2000). "I would never join the government alone without my colleagues". Free Serbia. Archived from the original on October 18, 2015. Retrieved September 18, 2015. ^ "Seven years since end of NATO bombing". B92. June 9, 2006. Archived from the original on September 26, 2015. Retrieved September 21, 2015. ^ a b c d "NATO bombs Yugoslavia". history.com. HISTORY. 21 July 2010. Retrieved 18 February 2019. ^ Corpus Christi Caller Times (June 27, 1999). "First planes land at Pristina airport". Caller2.com. Archived from the original on March 5, 2009. Retrieved March 24, 2009. ^ Lee Myers, Steven (14 June 1999). "Crisis in the Balkans: Checkpoint; Minimum Use of Force, And Maximum Confusion". nytimes.com. nytimes. Retrieved 25 February 2019. ^ "United Nation Case Information Sheet". United Nations | International Residual Mechanism for Criminal Tribunals. Retrieved 25 February 2019. ^ Dobbs, Michael (11 December 2000). "U.S. Advice Guided Milosevic Opposition". washingtonpost.com. washingtonpost. Retrieved 25 February 2019. ^ Tweedie, Neil (31 March 2009). "Kosovo War: Thousands killed as Serb forces tried to keep control of province". telegraph.co.uk. Telegraph. Retrieved 25 February 2019. ^ "Abuses against Serbs and Roma in the new Kosovo". Human Rights Watch. August 1999. Archived from the original on September 2, 2012. Retrieved December 4, 2016. ^ "Pristina Serbs prepare for exodus". The Guardian. June 10, 1999. Archived from the original on December 30, 2016. Retrieved December 15, 2016. ^ "Serbs Follow Yugoslav Forces Out of Kosovo in Reverse Exodus". Los Angeles Times. June 13, 1999. Archived from the original on October 5, 2015. Retrieved October 5, 2015. ^ "Crisis in the Balkans: Exodus; As NATO Pours In, Fearful Serbs Pour Out". The New York Times. June 14, 1999. Archived from the original on July 24, 2016. Retrieved February 11, 2017. ^ "NATO Fears Serb Exodus After Killings". The Washington Post. July 25, 1999. Archived from the original on May 25, 2018. Retrieved September 5, 2017. ^ "Rebels, ideas clash in Macedonia Renewed fighting comes after unity government formed". cnn.com. CNN. 9 May 2001. Retrieved 25 February 2019. ^ Vladisavljevic, Nebojsa. "Kosovo and Two Dimensions of the Contemporary Serb-Albanian Conflict". researchgate. researchgate.net. Retrieved 25 February 2019. ^ "British Military Aviation in 1999". rafmuseum. rafmuseum.org.uk. Retrieved 25 February 2019. ^ "Honours and Awards in the Armed Forces" (PDF). assets.publishing.service.gov.uk. Ministry of Defense. Retrieved 25 February 2019. ^ A. Halliday, Hugh. "Canada's Air Force in War and Peace". warmuseum. warmuseum.ca. Retrieved 25 February 2019. ^ Rezaian, Jason (17 February 2017). "10 years after independence, Kosovo's prime minister asks Washington for help with 'unfinished business'". washingtonpost.com. washingtonpost. Retrieved 25 February 2019. ^ Doggett, Tom (May 16, 1999). "Cohen Fears 100,000 Kosovo Men Killed by Serbs" Archived September 10, 2017, at the Wayback Machine. The Washington Post. ^ Clinton, Bill (May 13, 1999). "Speech by President to Veterans Organizations on Kosovo". www.clintonfoundation.org. Archived from the original on September 27, 2007. Retrieved October 26, 2016. ^ a b "Press Conference by the President (Bill Clinton)". clinton6.nara.gov. June 25, 1999. Archived from the original on June 29, 2007. Retrieved October 26, 2016. ^ "Clinton: Serbs must be stopped now" Archived May 16, 2008, at the Wayback Machine. CNN, March 23, 1999. ^ Judah (2009). The Serbs. Yale University Press. ISBN 978-0-300-15826-7. ^ "Serbia's Kosovo Cover-Up: Who Hid the Bodies?". Balkan Insight. 2015-04-23. Archived from the original on May 27, 2015. Retrieved June 10, 2015. The Belgrade officials and policemen who took hundreds of murdered Albanians' corpses from Kosovo to Serbia and concealed them in mass graves have never been prosecuted in their home country. ^ New York Times (March 12, 1999) "In Vote Clinton Sought to Avoid, House Backs a Force for Kosovo"
^ New York Times (April 29, 1999) House G.O.P. Adds Billions for Military In Balkans Package"
^ "On the Concurrent Resolution (S.Con.Res. 21 )". www.senate.gov. Archived from the original on November 2, 2011. Retrieved August 19, 2011. ^ On the NATO Bombing of Yugoslavia, Noam Chomsky interviewed by Danilo Mandic Archived February 20, 2014, at the Wayback Machine Chomsky.info, April 25, 2006, Accessed January 13, 2014. For the passage Chomsky presumably had in mind, see pp. xxii–iii of the introduction to Norris's book: "As nations throughout the region sought to reform their economies, mitigate ethnic tensions, and broaden civil society, Belgrade seemed to delight in continually moving in the opposite direction … It was Yugoslavia's resistance to the broader trends of political and economic reform—not the plight of Kosovar Albanians—that best explains NATO's war." ^ Talbott, Strobe, author of the foreword in Norris, John (2005). Collision Course: NATO, Russia, and Kosovo. Greenwood Publishing Group. ISBN 978-0-275-98753-4. ^ "Security Council Rejects Demand for Cessation of Use of Force Against Federal Republic of Yugoslavia". United Nations Organisation. March 26, 1999. Archived from the original on March 1, 2009. Retrieved April 19, 2009. ^ "ODS – Sédoc" (PDF). Archived from the original (PDF) on June 29, 2007. ^ Trounson, Rebecca. [http://articles.latimes.com/1999/apr/13/news/mn-27012 Yugoslavia Israelis Welcome Refugee Group as They Remember Holocaust]. Archived April 18, 2017, at the Wayback Machine. Los Angeles Times, April 13, 1999. ^ "No justice for the victims of NATO bombings". Amnesty International. April 23, 2009. Archived from the original on February 17, 2013. Retrieved December 4, 2016. ^ Steven Erlanger (June 8, 2000). "Rights Group Says NATO Bombing in Yugoslavia Violated Law". New York Times. Archived from the original on February 23, 2017. Retrieved February 11, 2017. ^ "Final Vote Results for Roll Call 49". clerk.house.gov. Archived from the original on October 18, 2012. Retrieved August 19, 2011. ^ "Final Vote Results for Roll Call 103". clerk.house.gov. Archived from the original on October 18, 2012. Retrieved August 19, 2011. Cox, Sebastian; Gray, Peter (2002). Air Power History: Turning Points from Kitty Hawk to Kosovo. Psychology Press. ISBN 978-0-7146-8257-0. Hosmer, Stephen T. (July 2, 2001). The Conflict Over Kosovo: Why Milosevic Decided to Settle When He Did. Rand Corporation. ISBN 978-0-8330-3238-6. Krieger, Heike (2001). The Kosovo Conflict and International Law: An Analytical Documentation 1974–1999. Cambridge: Cambridge University Press. ISBN 978-0-521-80071-6. Lambeth, Benjamin S. (2001). NATO's Air War for Kosovo: A Strategic and Operational Assessment (Report). Santa Monica, CA: RAND Corporation. ISBN 0-8330-3050-7. Macdonald, Scott (2007). Propaganda and Information Warfare in the Twenty-First Century: Altered Images and Deception Operations. Routledge. ISBN 9781135983512. McCormack, Timothy (2006). McDonald, Avril; McCormack, Timothy, eds. Yearbook of International Humanitarian Law – 2003. The Hague: T.M.C. Asser Press. ISBN 978-90-6704-203-1. Rip, Michael Russell; Hasik, James M. (2002). The Precision Revolution: GPS and the Future of Aerial Warfare. Annapolis, MD: Naval Institute Press. ISBN 978-1-55750-973-4. Parenti, Michael (2000). To Kill a Nation: The Attack on Yugoslavia. Verso. ISBN 978-1-85984-366-6. New York Times—Chinese Embassy Bombing: A Wide Net of Blame, April 17, 2000. Pashakhanlou, Arash Heydarian (2017). "Air power in humanitarian intervention: Kosovo and Libya in comparative perspective". Defence Studies. 18 (1): 39–57. doi:10.1080/14702436.2017.1420420. Wikimedia Commons has media related to 1999 NATO bombing of Yugoslavia. Lt. Col. Michael W. Lamb Sr. "Operation Allied Force: Golden Nuggets for Future Campaigns" (PDF). Retrieved June 22, 2009.